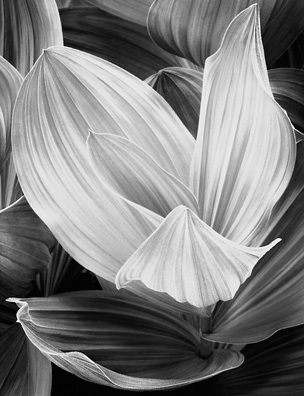 John Discusses His "Corn Lily" Image on New Podcast Series, "Why?" I was honored to be the inaugural guest in Skip Cohen University's new podcast series Why?. Skip and I have been friends for many years and worked together on a wide variety of projects. When he invited me to launch his new feature I was pleased to do so. He asked me to pick one of my favorite photographs, and I selected my image Corn Lily, Eastern Sierra Nevada, California, which appeared on the cover of my first book Quiet Light. Each week of the series Skip asks a photographer why the image is special, what makes it unique, or what made it a favorite of the artist. Each podcast episode is short and sweet (mine is about five minutes long). You can listen to the podcast at the Skip Cohen University website here. 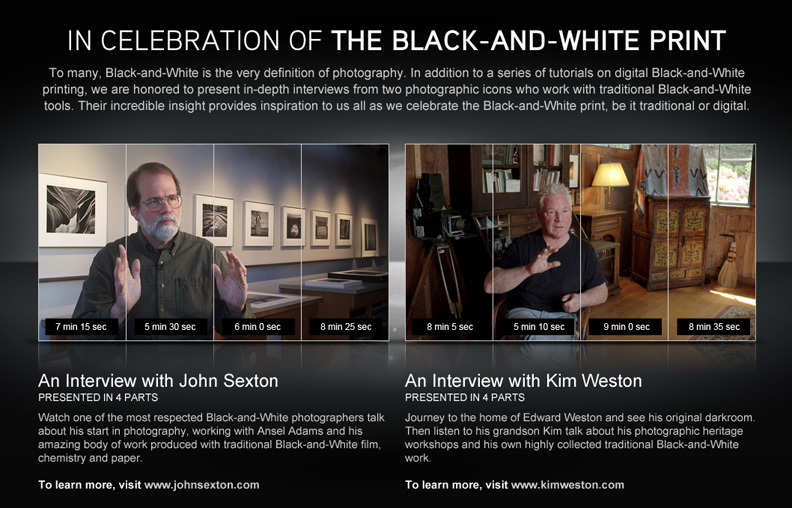 Watch John Sexton, along with his longtime friend Kim Weston, discuss their passion for the black- and- white print in these brand new videos produced by Epson. video interview turned out. If you have a few moments, you may want to check it out, along with the interview with Kim Weston. There are three additional segments coming. In addition there are tutorials on black and white digital techniques by pals Dan Steinhardt and Tony Corbell. Listen to John Sexton talk with longtime friend, Skip Cohen, about quality. I recently had the opportunity to talk with my longtime friend, Skip Cohen, about quality. I have known Skip for nearly 30 years. He is the President of Skip Cohen University, and was formerly the president of Hasselblad. The entire podcast runs 44 minutes and is part of Skip's "Weekend Wisdom" podcast series. You can subscribe to the series on iTunes. Have fun! Watch the recently released video: Remembering Brett Weston with Randy Efros, John Sexton, and Kim Weston. Gain insights into the man, and the photographer, Brett Weston, and learn about his passion for photography and for life. During the 2013 Photo Moncton International photographic conference in New Brunswick, Canada, I joined my colleague Peter Spence for an insightful interview that is engaging for photo enthusiasts whether you are a professional or an amateur. Peter is a professional photographer in Halifax, Canada and he promotes photography with a radio show for Nikon called Northern Exposure. Our interview shares my insights around my career that reveal the choices in equipment, my relationship with Nikon, and the approaches that have been part of my photography over the years. Peter and I explore my inspirations, which have contributed, to my love affair with black and white photography and led to the preferences in equipment that have accompanied my passion in photography. Thomas Harrop, editor of PhotoVision magazine, conducts an in depth interview with John. John discusses his ongoing excitement and passion for photography and the magic of the black and white print. I'm pleased to announce that Kodak Professional Imaging has recently featured my photography. Kodak Professional Imaging has just launched a video podcast about my photography and me. We taped the video interview last fall while I was in New York for the PhotoPlus Expo. I was there helping Kodak launch the new and improved T-Max 400 Professional black and white film. You can view the 11-minute podcast online, download the file (it's big - 124MB), or subscribe to the podcast on Apple iTunes. My old friend John Paul Caponigro has added an interview with me to his excellent Artists on Art series at his web site, www.johnpaulcaponigro.com. Read interview. Watch interview. John conducted this interview in November 2000 for Camera Arts magazine to coincide with the publication of my previous book, Places of Power. John's web site, which has an elegant and beautiful design, is also filled with useful information for photographers working in the digital domain, along with inspiring images, ideas, concepts, and information for anyone making images. Learn about upcoming events, photographic projects, news, and receive special discount offers, along with John's popular e-mail newsletter. Please indicate if you would like to join John's postal mailing list, e-mail newsletter list, or both mailing lists. We do NOT share your information with others. © Copyright 1998-2016 John Sexton. All rights reserved.